Offers: Discounts for - 9 Hole Rounds; Juniors; Society Groups. Excellent Clubhouse Facilities. Fully Stocked Professional Shop. Golf Practice Area. Sedbergh Golf Club is set in the heart of the beautiful Yorkshire Dales countryside and with the howgill fells forming a magnificent backdrop, the course has been described by many as one of the most scenic and tranquil in the north of England. The course itself has been professionally designed and constructed, making the most of the naturally undulating parkland. With several tree lined holes and fairways crossing or running alongside both rivers, the emphasis is placed upon accuracy, rather than distance. 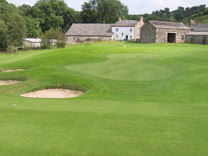 Well guarded greens (made to USGA specifications) and water features aplenty ensure that Sedbergh Golf Club provides a test for golfers of every ability. The members and staff of Sedbergh Golf Club offer a warm and friendly welcome to visitors.